“You don’t like to think about a holocaust, but it’s quite possible,” he said. He referred to the long-standing belief among many anthropologists that H. sapiens exterminated Neanderthals with superior weapons and intellect. For a long time, there seemed to be no other explanation for the rapid disappearance of Neanderthals after H. sapiens arrived in their territories. Today, however, there is a growing body of evidence from the field of population genetics that tells a very different story about what happened when the two groups of early humans lived together, sharing the same caves and hearths. Anthropologists like Milford Wolpoff, of the University of Michigan, and John Hawks have suggested that the two groups formed a new, hybrid human culture. Instead of exterminating Neanderthals, their theory goes, H. sapiens had children with them until Neanderthals’ genetic uniqueness slowly dissolved into H. sapiens over the generations. 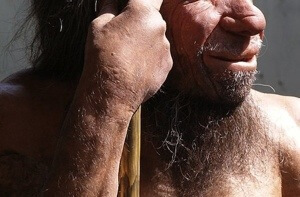 This idea is supported by compelling evidence that modern humans carry Neanderthal genes in our DNA. Regardless of whether H. sapiens murdered or married the Neanderthals they met in the frozen forests of Europe and Russia, the fact remains that our barrel-chested cousins no longer walk among us. They are a group of humans who went extinct. The story of how that happened is as much about survival as it is about destruction. —Popular Science. 19 May 2013 in Culture, Science. ← Why Can’t Millennials Find Jobs?